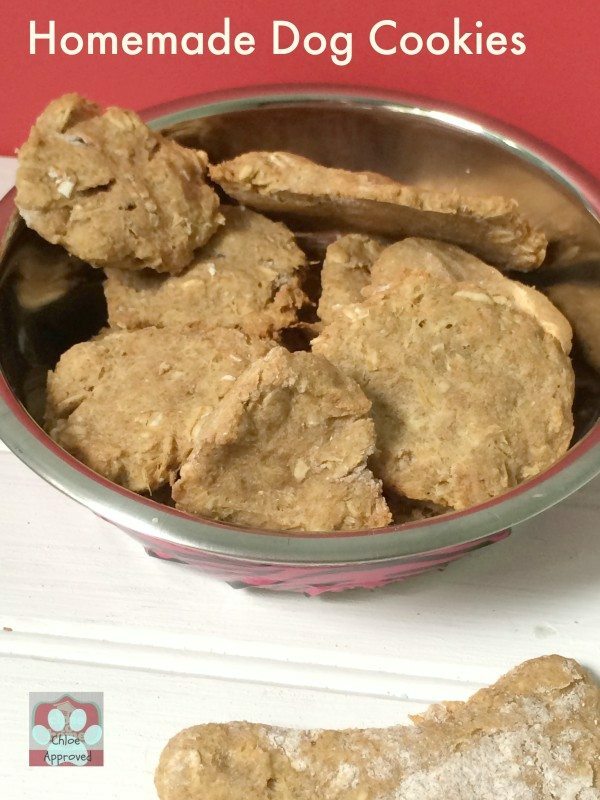 Secret Recipe Club has gone to the dogs with this Simple Homemade Dog Treats Recipe. Ok not really I just chose to create a recipe that This Mama Cooks that happened to be this Dog Treat cookie recipe. I love the 2nd Monday of the month when it is once again it is time for the Secret Recipe Club reveal. So fun to go through other food blogs and find a recipe to try. Even more exciting is to see what others thought was an interesting recipe to try off my blog. Essentially it is like secret santa just with recipes! 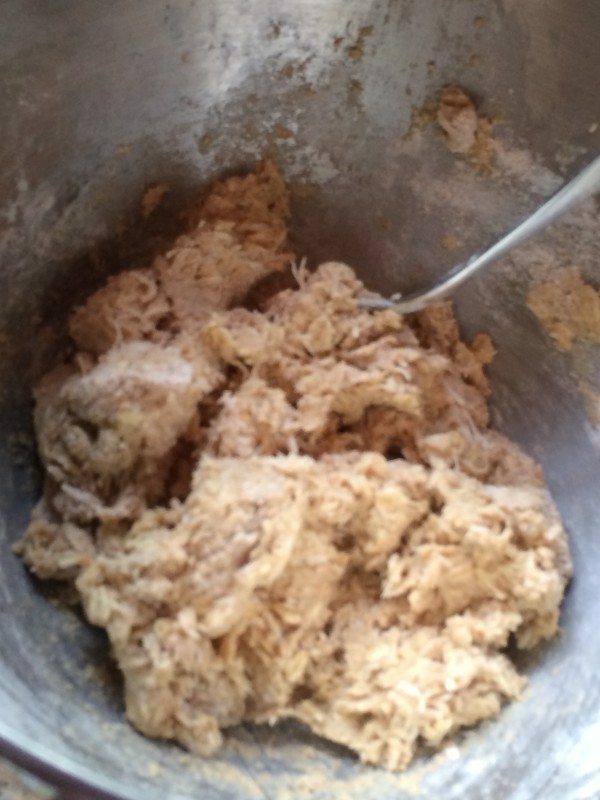 Simple Homemade Dog Treats Recipe is the one I picked. For those of you new to this club concept, each month each blogger is assigned another blog and secretly find a recipe post that we would like to try, finally to reveal our experience with their recipe. You are sure to find some wonderful and low fat recipe on This Mama Cooks on a Diet like Dairy Free Key Lime Mouse or these Gluten Free Strawberry Rhubarb Crisps. They all look so good. She has been blogging for 10 years and has been keeping busy sharing wonderful recipes that even those on a diet can eat. Funny thing is I thought they were going to be a disaster because I had the wrong ingredient in my head, I just read turkey baby food and purchased those little nasty jars of pure turkey. I am no stranger to homemade dog treats, I have made quite a few since Chloe came alone. I even made her a homemade Dog cake for her first birthday. However, when I got home I was floored and I did not have time to go back to the store as I was leaving for 5 days and the priorities of my do-to lists were building. We had to improvise this Dog treat recipe with a can Chicken and Gravy Dog food. At this point I was not sure if this was going to work. Look at the shreds of chicken in the batter. I really could have puree the dog food but who has time. Rolling the dough out was a little challenging, so I just scooped balls and flattened them. Chloe at the first one she almost choked because I really don’t think she chews her food. 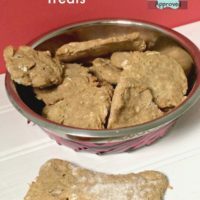 What do you think about these Simple Homemade Dog Treats Recipe? 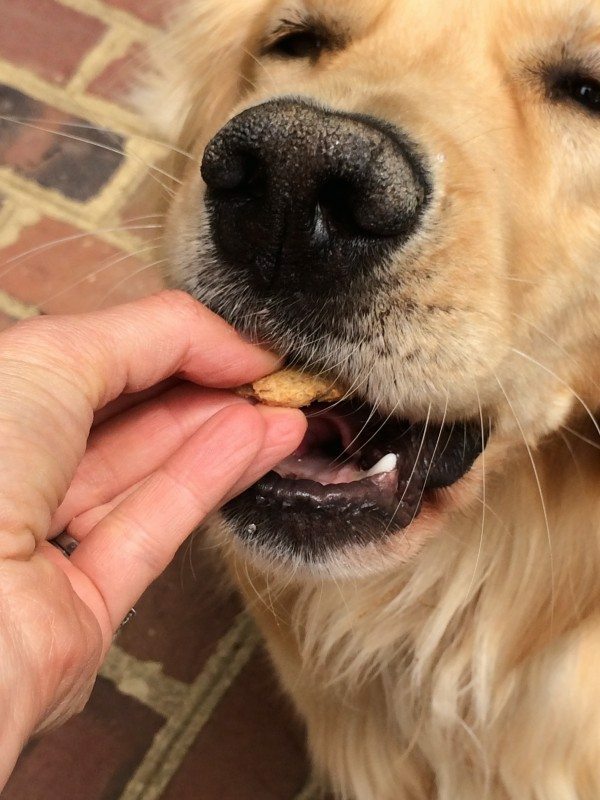 Easy Homemade Dog Treats that are better than anything you can buy at the store. 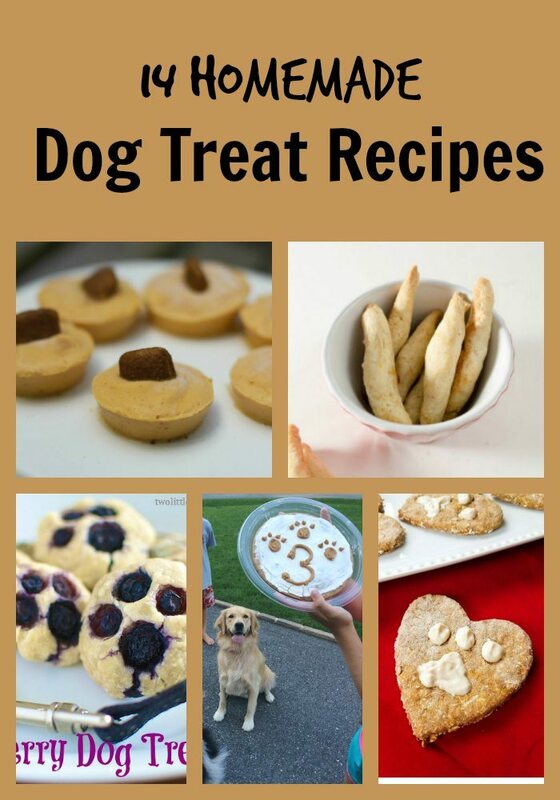 Your pup will love these. 1 1/4 cups brown rice flour, plus more for rolling We used half whole wheat flour. Preheat the oven to 325 degrees F. Line 2 cookie sheets with parchment paper or a silpat. Place baby food & Dog food if using, egg, and oil in a large bowl and beat with a fork until well combined. Stir in flour and oats and mix together. Transfer to the oven and bake 30 minutes. Turn the oven off and leave cookies in the oven to crisp up for 15 minutes. Transfer the cookies to a wire rack and cool completely. If your dog will let you. 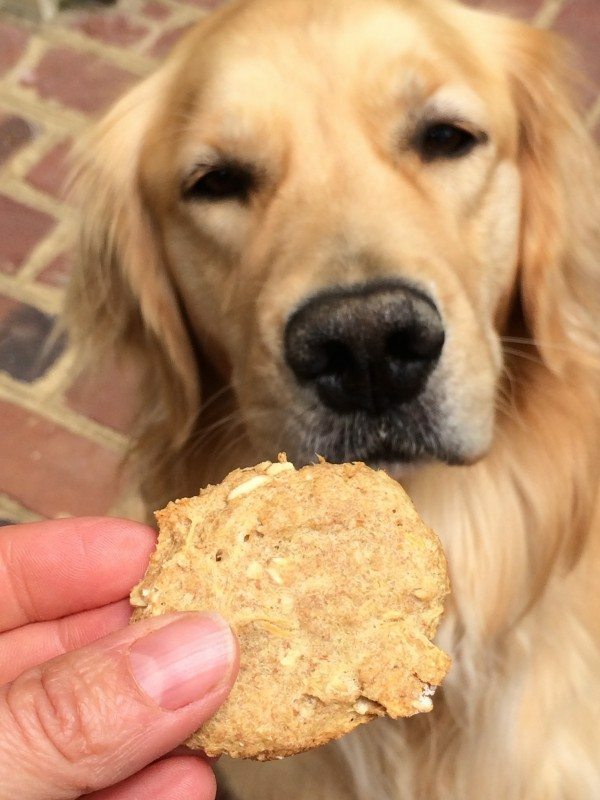 Find our ultimate List of Homemade Dog Treats here too! I am sure he wont know the difference if you make him some more:) What kind of dog did you get Danielle? Our pups first birthday was Monday and my kids made some homemade treats for him. I wish I would have seen this one sooner. Looks like your furbaby enjoyed the treats! My mom was just mentioning something about wanting to make treats for her dogs. Talk about perfect timing! 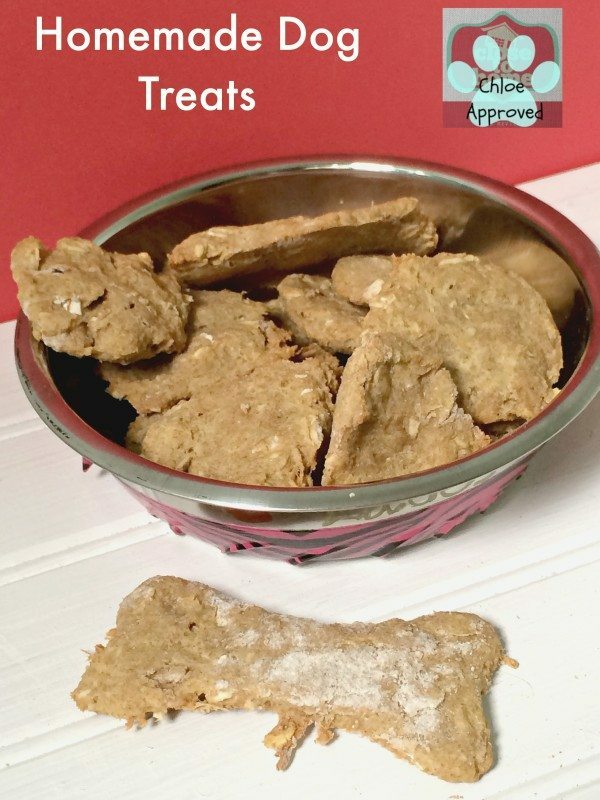 Homemade Dog treats are so easy to make and nice knowing exactly what is in them. I wish I had a dog to make the treats for. This is such a great idea. I used to make dog treats for our dog. She loved them! What a sweet girl! It’s great she got the SRC love this month! What a fun recipe for SRC. I’m going to try this on my Chimi, I think she’ll love it. Chloe is too cute! So glad she enjoyed them. I don’t think Nellie chews her food all that well either the first time she gets a new treat. She’s just too excited.